Festung Europa: The Campaign for Western Europe, 1943–1945 is the long awaited follow-up to the highly popular card driven game, Shifting Sands: The Campaign for North Africa, 1940–1943 (from MMP). 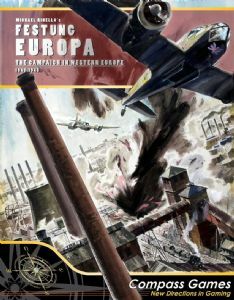 Designed by Charles S. Roberts Award winner Michael Rinella, Festung Europa allows players to step into the shoes of either the Allies, led by the United States and Great Britain, or the Axis, led by Germany and Italy. As the Allied player you must use your plentiful economic resources and military assets to successfully invade the European continent, defeat the Axis powers, and liberate Central Europe before it is occupied by the Soviet Union. As the Axis player you must use the advantage of interior lines and the tactical skills of the German Army to stubbornly delay the Allies, prevent them from occupying German soil, and potentially frighten them into signing a separate peace to prevent a communist takeover of Central Europe. The primary difference between Festung Europa and Shifting Sands, other than subject matter, consists of a major streamlining of a number of game mechanics found in numerous card driven games of the past. Gone are elaborate special cases and restrictions that had to be remembered each and every action round, allowing players to concentrate on the sorts of decisions faced by the historical participants. Easy to set up, with a maximum of just ten turns, a complete campaign game may be played in a single evening. Also included is an Operation Overlord scenario which has an even quicker playing time. The Allies possess dominance of the skies and seas and a fully motorized army, granting them the flexibility to attack where they want and when they want. Time is not on their side, however, and they much accomplish much before the clock runs out. The Axis have equally large if not quite as mobile forces, and may make use of formidable natural as well as man-made obstacles to slow Allied progress and launch short, sharp, offensives where the opportunity presents itself. The fate of Europe for the next half century is about to be decided—only now you are in command!